Jordanian rescuers search for survivors of flash floods at the Dead Sea area, Jordan, Friday, Oct. 26, 2018. 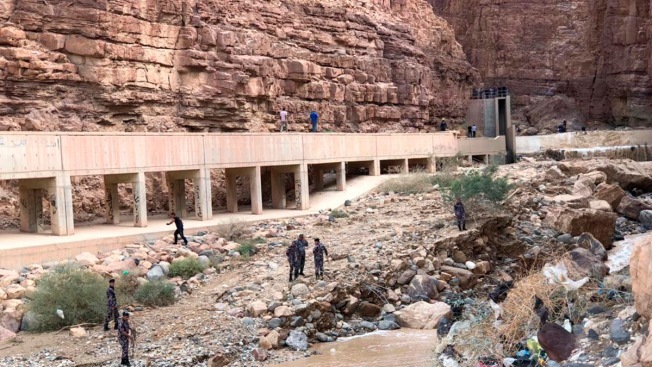 The death toll from flash floods near Jordan's shore of the Dead Sea rose to 21 on Friday, in what Civil Defense officials said was one of the deadliest incidents in the kingdom involving schoolchildren. The body of a 12-year-old girl was found early on Friday, said the director general of the Civil Defense, Mustafa al-Basaiah. By late Friday, one person was still feared missing. Thirteen of the dead and 26 of about three dozen people injured in Thursday's flash floods were middle school children, officials said. They said three of those killed, including two students, were Iraqis living in Amman. The incident began early Thursday afternoon when 37 students from an Amman private school, along with seven adult chaperones, as well as other visitors were taking a break at hot springs several kilometers from the Dead Sea shores. Sudden heavy rains sent flash floods surging toward them from higher ground, sweeping them away, some as far as the Dead Sea, officials said. An extensive rescue operation involving helicopters, divers, sniffer dogs and hundreds of searchers continued into the night Thursday and resumed Friday. Israel's military said it also dispatched a rescue team at the request of the Jordanian government. Brig. Gen. Farid al-Sharaa, a Civil Defense spokesman, said Friday that the flooding was one of the deadliest incidents in recent memory involving schoolchildren. Jordan's King Abdullah II canceled a planned working visit to Bahrain, initially scheduled for Friday. He was to have been the keynote speaker at a security conference. In a message on his Twitter account, the monarch said that "the pain of each father, mother and family is my pain." He also expressed anger toward those who he said: "failed to take measures that could have prevented this painful incident." The monarch later chaired a meeting of the National Policies Council, a group of high-level officials. He asked for a detailed report of the incident, including identifying who was to blame for the deaths. Earlier, he ordered the Jordanian flag at the palace's main entrance to fly at half-staff for three days in mourning for the victims of the flood. The U.N. secretary general and several regional leaders sent condolences. The low-lying Dead Sea area is prone to flash flooding when rainwater rushes down from adjacent hills. In April, 10 Israeli students were killed in a flash flood while on a hiking trip near the Dead Sea.